Back from an off-season European vacation to Lisbon and boy are my Portugals tired. October's a good time to visit Portugal, if you accept the occasional all-day rain squall that turns pitched cobblestone streets into bowling lanes of tourists in their mid-60s, rolling and sliding from one side to the other. Most locals walk in their streets when possible, because the softer grooves worn by cars provide better footing than the slick black-and-white stones used ubiquitously for sidewalks. Those sidewalks include lots of old patterns and mosaics, which look cool--just ask Wikipedia--but also sprain ankles in wet season. Portugal himself pitched an exactly average 100 ERA+ by SABR metrics (career stats), peaking with an 18-4, 139 ERA+ season in 1993. After a sub-par 1999 with Boston (his final big-league work) Cincy invited Mark to spring training in 2000, but he couldn't stick there and retired at 36. 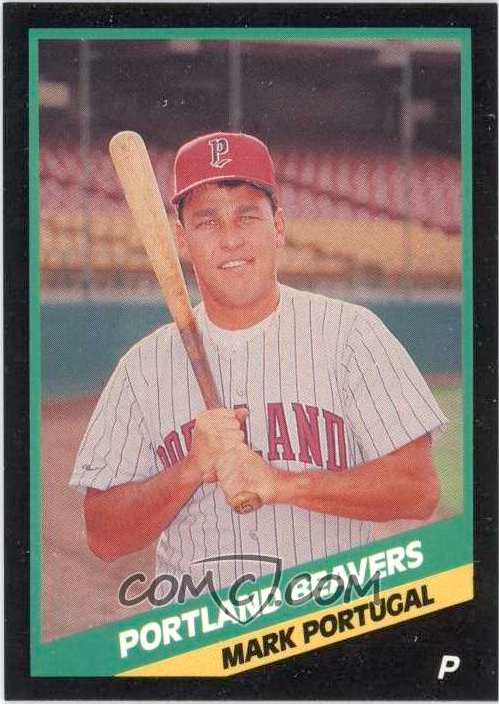 Value: This #5 lists for $2.74 at COMC, high for an 80s card, but you can't beat the convenience. I assume team sets would run $5-10. 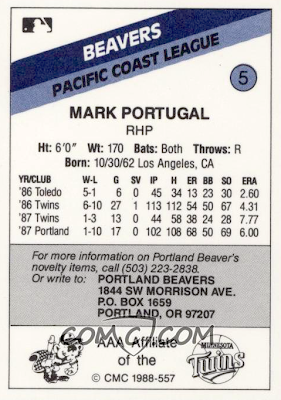 Fakes / reprints: Mark Portugal had a nice long career in the majors, but it's hard to imagine anyone profiting by faking his minor league cards.